Not sure why you want the spider diff cover. I think it is an unneeded piece. It doesnt protect anything but backing into a rock. lol for exactly that reason. I wouldnt want something as stupid as backing up into a rock to ruin my day. Although I would much rather a thick steel version of our diff cover. Zero wrote: lol for exactly that reason. I wouldnt want something as stupid as backing up into a rock to ruin my day. Although I would much rather a thick steel version of our diff cover. I guess it is not really totally unneeded, but i would rather have a thicker cover as well. I should just be happy someone made something for us. HARDTRAILZ wrote: Not sure why you want the spider diff cover. I think it is an unneeded piece. It doesnt protect anything but backing into a rock. Exactly! Teebes and I saved a huge amount of time on the Rubicon not having to spot each other's rears so much. With two spotters it would have been doable, but slower. Even with our tight turning radius, there are a LOT of places on these trails where it's tight side to side with trees, and you sometimes don't get a well-placed rock to use as a pivot, so there's a lot of 3-4 point turns for our relatively large wheelbase. And the surface is totally lumpy with 8-16" water-smoothed rocks. SO having the spider means if we need spotting, the spotter doesn't have to constantly run front/back and worry about the diff. 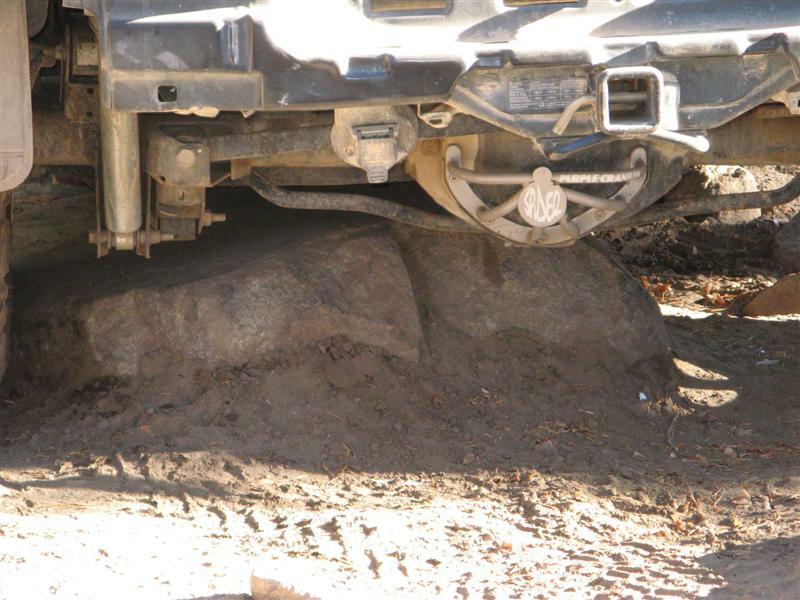 The cover is so thin that ANY contact with a rock while backing up would have been fatal. It's like a pimp curb feeler for the diff. Not absolutely necessary, but saves you getting out all the time to look. Alright...you got me. I will order one. I was playing in stuff just like that and didnot even bother to worry about the rear cover since the housing takes most of the abuse, but for a bit of extra protection would be cheap insurance. My diff cover has a couple scars from rocks. I've needed to get on this as well. Unless someone was so ambitious as to take a spare cover and fab up a replacement with steel..
Guys, lets not forget what this thread is about... back on topic please. So how's the pricing coming along for a production run? I'd be interested in prices that include a forged JJ per link, too! Kyle - How'd everything feel furing your recent outing? Notice anything different with the on-road performance (I'd hope not since both sides of the arms are bushings)? teebes wrote: So how's the pricing coming along for a production run? I'd be interested in prices that include a forged JJ per link, too! No different onroad, and did not feel different off, but I need to wash the mud off to see if it looks like I got anything to hit. I'm still looking for a flex joint that will work on our trucks. I haven't been able to find one that is the right mounting width. I have a few places I need to call and see if they needs anything I can use. From the looks of things I should be able to make the control arms with flex joints for about 100 bucks more for a set. How wide are our mounts? I thought the 2" JJ's might work, but maybe that measurement doesn't include the misalignment spacers?? They are a little over 2.25". I haven't been able to find anything except 2", 2.375", and 2.625". teebes wrote: How wide are our mounts? I thought the 2" JJ's might work, but maybe that measurement doesn't include the misalignment spacers?? Last edited by gotricebih on Mon Aug 23, 2010 4:47 pm, edited 1 time in total. Isn't that what washers are for? Ok... so it isn't ideal. Maybe use washers to take up the space? We already do that with our rear shocks. I can make spacers so there would be no need to use washers. I'm just looking for a safer alternative. gotricebih wrote: I can make spacers so there would be no need to use washers. I'm just looking for a safer alternative. Throw the miss-alignment spacers off the 2.375 in a lathe and take of 0.0625 off each one... That would give you the 2.25" your looking for..
Those joints that I've found also have the wrong size bolt hole. I would have to drill all of them out from 12mm to 14mm and then turn them down to the right length. I may have to do that if I can't find one with the right width. gotricebih wrote: Those joints that I've found also have the wrong size bolt hole. I would have to drill all of them out from 12mm to 14mm and then turn them down to the right length. Argh.. Which joints where you looking at?